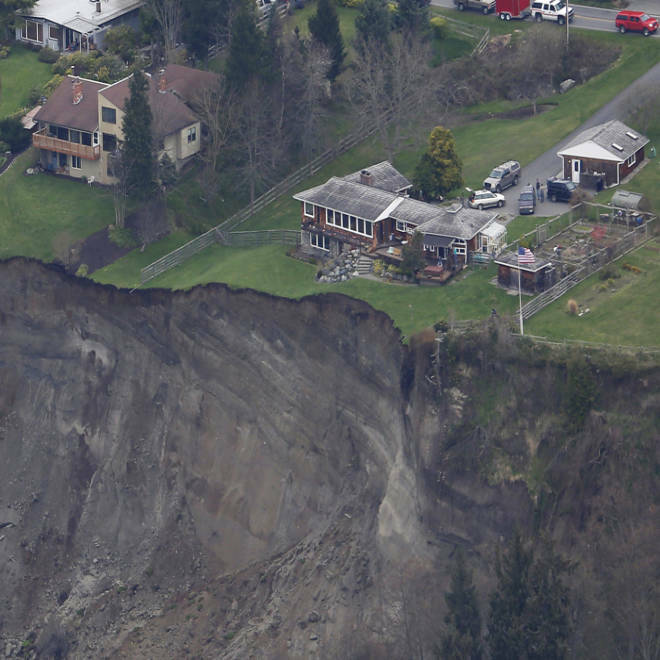 A house sits near the edge of a landslide, near Coupeville, Wash., on Whidbey Island, on March 27. Residents of a scenic Washington state island hunkered down wherever they safely could Thursday as officials assessed damage from a huge landslide that knocked one home off its foundation and threatened dozens more. "It's possible more homes could be lost. We're trying to ensure the safety and awareness of people," Central Whidbey Fire and Rescue Chief Ed Hartin told KOMO-TV in Seattle. "There's not anything we can do to stop the movement of the ground." Wednesday's landslide on the west side of Whidbey Island, near the town of Coupeville, was about a quarter-mile wide and a half-mile deep. The early-morning landslide washed a road away, wiped out power lines and water mains, and plunged one home off the island's crumbling bluff, while threatening or cutting off access to 34 others, NBC's Miguel Almaguer reported on TODAY. The Whidbey Island landslide has residents nervous as several homes sit precariously on the edge. Some of the evacuation orders were lifted late Wednesday but it's still dangerous for more than a dozen homeowners to return. NBC's Miguel Almaguer reports. Bret Holmes, a Whidbey Island resident, lost half his backyard. He said insurance won't cover the damage. “It makes me sick to my stomach and having to go through this, when that’s the first news I got,” he said. Landslides are relatively common in the area, but one of this magnitude is rare. Geologists are looking into the role that rain and snow may have played, although there hasn't been significant rainfall in recent days. Emergency crews, unable to access local roads, used Microsoft CEO Steve Ballmer's property to assess damage on Wednesday. A Red Cross relief center was set up for residents who had to evacuate. Residents of the island, which overlooks the Puget Sound, gathered for an emergency meeting Wednesday evening. Engineers continued assessing the safety of homes on Thursday while anxious residents awaited word. Resident Ralph Young, who was forced to evacuate with his wife Cheryl, told NBC affiliate KING-5 in Seattle the landslide sounded like "thunder, rolling thunder." "From down below, when you look up at the bluff, the devastation is just awful. Really just heart-wrenching,” he told KING-5. Neighbors were assisting each other with loading furniture and clothing out of their homes, KOMO reported. "I have no feelings whatsoever," Delia Curt told KOMO as she hauled away belongings. "I'm totally numb." Coupeville is about 50 miles outside of Seattle. The state warns people interested in buying shoreline property about the landslide hazards. NBC News' Jeff Black contributed to this report.